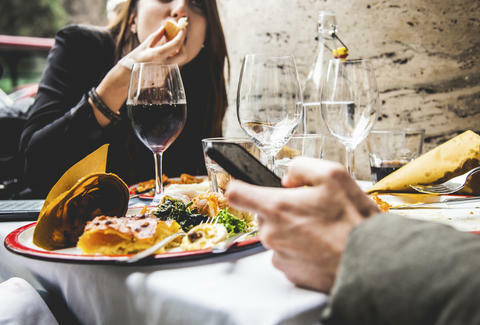 Whipping out your phone at the dinner table might seem harmless -- especially if everyone else is doing it -- but a new study by the Pew Research Center reveals that deep down, most of us find the practice pretty repugnant. The study asked 3,217 adults to weigh in on whether or not they approved of cell phone use in various public areas, and while some settings were widely accepted -- like waiting in line (74%) and riding public transportation (75%), 88% of respondents felt that whipping your phone out at the dinner table is generally not a cool thing to do. The poll didn't specify whether "doing it for the 'gram" was an acceptable excuse, however. That being said, 89% of cellphone users admitted to using their device in one way or another during their most recent social gathering (dinner or otherwise), most often to do something related to the group like posting a photo/video, getting useful information, or connecting with mutual friends. 30% of users even admitted to diving into their phones as an escape from the group, which is probably a conservative number. So, while most of us find constant cellphone use abhorrent, we're all guilty of it, and it's usually not as bad as it seems. Usually.